As he does every day, Farmer John is hanging the family's clothes and towels out to dry. Today, however, things are a little bit unusual. The line is full of undies. The veggies in the patch below are in wonder. 'What are those?' asks Pumpkin. Cucumber doesn't know but Beet things they look comfy. Mushroom thinks they look rather silly and Asparagus thinks they should definitely invest in some. But how can they find any if they don't even know what they are? Enter Carrot. He knows. The other veggies are fascinated and are desperate to try the undies on, so they set about pulling them down from the line. Beet puts his undies on his stalk. Corn puts them on his head, but Carrot soon sets them straight and soon enough, the veggies are soon sporting their saucy new apparel. But wait--something doesn't feel so right. Could it be the dreaded ... wedgie! 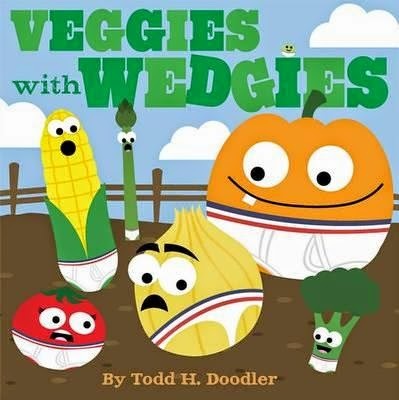 This adorably funny book is just the fodder for young kiddles who love to giggle. A perfect read-aloud book for groups, both the super-cute illustrations and chaotic dialogue will have them peeping with glee. There's even a song kids could make up a catchy tune for.